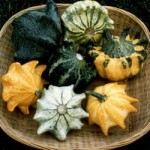 There are 11 types of gourds available form the Assiter Punkin Ranch. The Crown of Thorns produces a variety of striped and bicolor gourds of light and dark green, orange, yellow, and white. It is 4-5 inches in diameter. This is a unique gourd of many colors with wings. It is in the shape of a swan. 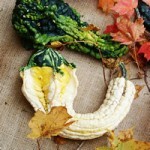 This gourd makes for a great addition to any fall decorations. 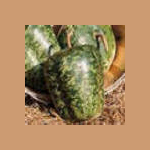 This gourd is a tree apple shape. They last forever. They are green in color, but paint them red and your teacher will love it! 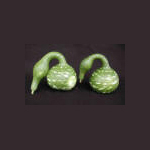 The Birdhouse gourd is a light green color. They are thick-skinned and used for crafts and decorations. Paint them any color, they are attractive to many different types of birds. 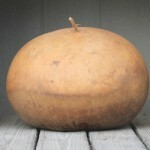 A Bushel gourd is brown and round shaped. It is 12-18 inches in diameter. This gourd is great for arts and crafts when dried. 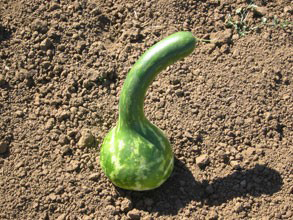 This gourd has a long, slightly curved neck. It has a hard shell and is great for making crafts such as, ladles, scoops, and decorative birdhouses. 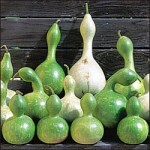 This gourd has a large, speckled crookneck. It’s shape resembles a swan.